Preheat oven to 350 degrees. 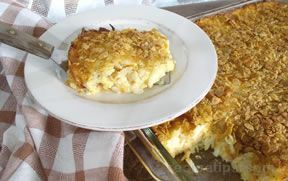 Pierce potatoes and place on baking pan. Bake the potatoes for 1 hour and 15 minutes until very soft. Peel and mash the potatoes in a large bowl with a potato masher or back of fork. Add the cream cheese, butter, 1 cup of cheddar cheese and the sour cream. Stir well. Add the garlic, salt and pepper and stir again. Spray a 13 X 9 baking dish with cooking spray and place the potatoes into the dish. Bake at 350 degrees for 30-35 minutes until hot. 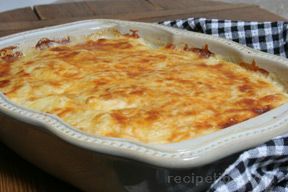 Sprinkle the remaining 1 cup cheddar cheese over top of casserole and bake for 5 minutes until cheese melts. Garnish with chopped chives and crumbled bacon before serving.